Why? : Um because LOOK AT IT! Oh Happy Day: I can still remember the first time I drove up to Lake Pukaki and this scene. It was back in January 2008, I had gone on a road trip of the South Island and had stayed in Twizel the night before. I was hoping to see some glimpse of Aoraki/Mount Cook but she can be notoriously shy and is often covered or half covered in clouds. But as I drove closer, I could see that I was going to be in luck and managed to get some shots before the cloud did appear. The above photo is from the 2nd time I did this trip and as you can see, the day could not have been better. 50 Shades of Blue: If anyone has been to Lake Pukaki, you will know that photos just do not do this lake justice. The waters of Pukaki are fed by glaciers of the Southern Alps, which give the lake the most amazing colour of blue. Looking at the lake is like looking at glass. Then you have the stunning Southern Alps looking like they rise straight from the waters, and from a distance seem to reflect the colours of the lake. On a day like I had in April 2016, it was blue, upon blue, upon blue.. luckily my favourite colour is.. you guessed it – blue. Close Up: I have seen Aoraki/Mount Cook from a distance numerous times when flying in & out of Christchurch. On a clear day, you can see right down the length of the Southern Alps. Even if there is a lot of cloud cover, sometimes you will see Aoraki/Mount Cook peaking above the clouds. Did you know? : The word ‘aoraki’ in Maori means ‘cloud piercer’. 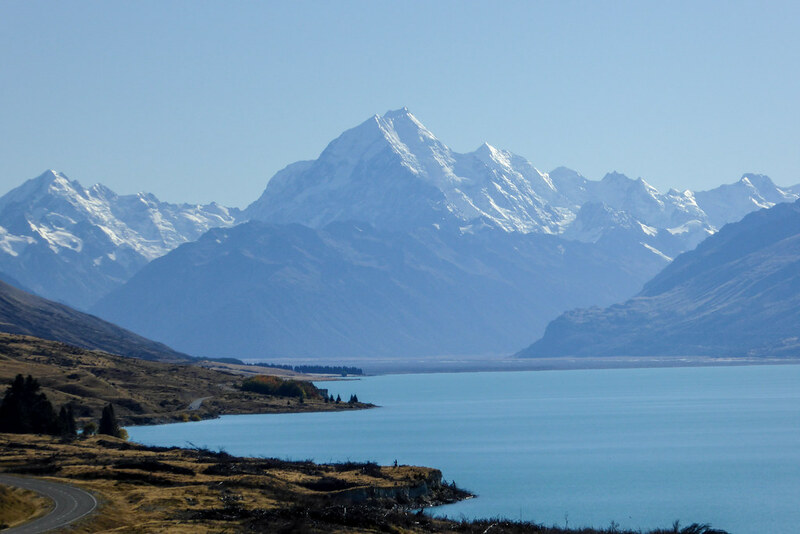 Whilst the mountain was known as Mt Cook for many years, the official name is now Aoraki/Mount Cook and is New Zealand’s tallest peak. ‘Pukaki’ however has a more vague meaning of ‘bunched up waters’?! What Surprised Me: I was completely surprised that I could pretty much drive right up to the Aoraki/Mount Cook village at the base of the mountain. The road to the village is amazingly good and has plenty of places to stop and enjoy the scenery. What I Love About This Place: Why I love this area of New Zealand so much is that no matter how many times I go there, the view still amazes me. This is one of the things that make me so proud to be a Kiwi. Being able to show photos like this to people of different countries and nationalities and be like “Yep, that’s my backyard” just makes me so happy. I know there are beautiful places all over the world but there really isn’t any place like home. Next Why Can’t I Decide? If that is your backyard, I am as green as green can get. The deepest shade of bottle green. Apologies, I thought maybe you had shifted. I remember you had talked about living in Brisbane earlier. The best of both worlds, hee haw! Wow beautiful! That scenery would make me happy too! Beautiful post with beautiful pictures and descriptions ! Being driving distance from Tekapo and Aoraki has to be once of the best things about living in Christchurch. I love sitting in the hot pools in the snow.